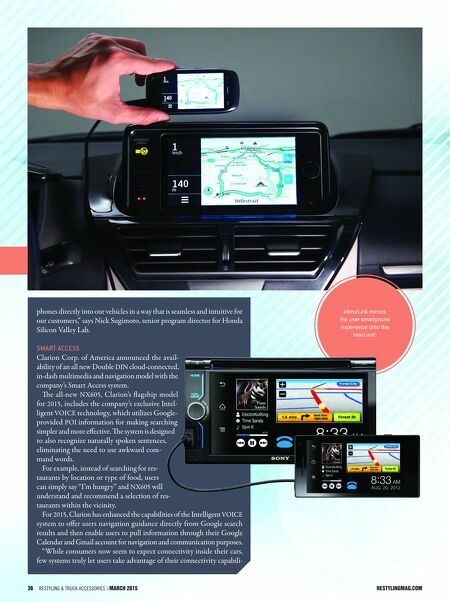 36 Restyling & tRuck AccessoRies | March 2015 restylingmag.com phones directly into our vehicles in a way that is seamless and intuitive for our customers," says Nick Sugimoto, senior program director for Honda Silicon Valley Lab. Smart acceSS Clarion Corp. of America announced the avail- ability of an all new Double DIN cloud-connected, in-dash multimedia and navigation model with the company's Smart Access system. e all-new NX605, Clarion's flagship model for 2015, includes the company's exclusive Intel- ligent VOICE technolog y, which utilizes Google- provided POI information for making searching simpler and more effective. e system is designed to also recognize naturally spoken sentences, eliminating the need to use awkward com- mand words. For example, instead of searching for res- taurants by location or type of food, users can simply say "I'm hungry" and NX605 will understand and recommend a selection of res- taurants within the vicinity. For 2015, Clarion has enhanced the capabilities of the Intelligent VOICE system to offer users navigation guidance directly from Google search results and then enable users to pull information through their Google Calendar and Gmail account for navigation and communication purposes. 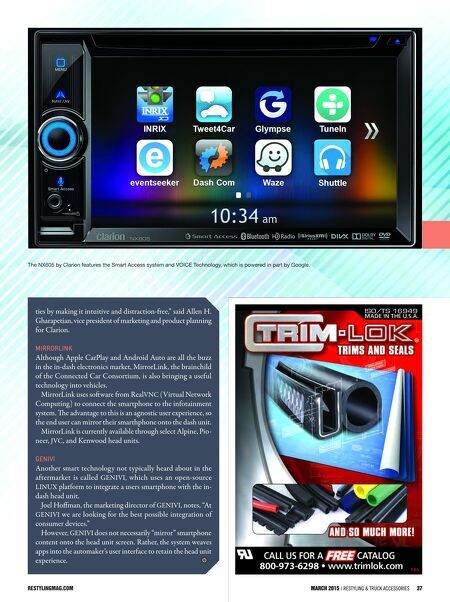 "While consumers now seem to expect connectivity inside their cars, few systems truly let users take advantage of their connectivity capabili- 36 Restyling & tRuck AccessoRies | March 2015 restylingMag.coM MirrorLink mirrors the user smartphone experience onto the head unit.